Mining influences the natural and social environment to a great extent. More than other industries, the mining industry is aware of this impact, especially regarding their historical legacy. Responsible mining is characterized by this awareness and the dealing with the impact. The common definition of sustainable development reflects the combination of that awareness and the handling of development in present and future. Refusal of mining does not represent a sustainable development because the present generation needs raw materials for their living. Rather, mining needs to be performed with regard to the responsibility for the present and the future. Therefore, the mapping of needs and impacts represents an essential task for sustainable activities. Taking up the definition of sustainable development, responsible mining should shape the presence, add value and keep doors open for future generation and provide them a plurality of options without comprising future abilities. Hereafter, thoughts and ideas for those areas are presented for sustainable mining practice. Afterwards, possibilities are shown to integrate discussed aspects into the mining engineering education. Mining influences the natural and social environment to a great extent. More than other industries, the mining industry is aware of this impact, especially regarding their historical legacy. Responsible mining is characterized by this awareness and the dealing with the impact. Also, mining companies take on the responsibility for the mineral supply and support the economic development by the mineral extraction (1, 2). The common definition of sustainable development according to the Brundtland-Commission reflects the combination of that awareness and the handling of development in present and future. It is a “development that meets the needs of the present without compromising the ability of future generations to meet their own needs.” (3). Refusal of mining does not represent a sustainable development because the present generation needs raw materials for their living. Rather, mining needs to be performed with regard to the responsibility for the present and the future. Therefore, the mapping of needs and impacts represents an essential task for sustainable activities. Due to the numerous affected areas and stakeholders, the mapping is complex and the task cannot be solved completely. By using the triple-bottom-line concept, which is considering the areas of economy, environment and society, a consciousness of affected sectors can be created by focusing on three areas. The Australian Centre for Sustainable Mining Practices (ACSMP) expands the concept for sustainable mine practice by introducing two important points for the mining industry: resource efficiency and safety. The deposits are the basis for the activity. They are limited and predetermined but dictate the approach. Resource efficiency represents a responsible exploitation. Furthermore, safety is an important focus of the mining practice. Often, approaches and measures differ from other industries because of the operational characteristics, the accessibility as well as the dimensions (4). Relating to the exploitation of mineral resources, resource efficiency is discussed less often than relating to materials or energy. Besides present demands, a sustainable design must consider the future needs. The exclusive mining of high-grade areas is not sustainable if the subsequent extraction is hindered. At best, deposits can get fully exploited (4). Though, the definition of waste and value is changing depending on the available technology and the demand at the date of mining. Hence, waste can become value and non-profitable areas can be exploitable or a reprocessing of tailings is considered. Since 2015, the recycling of tailings is investigated at the former ore mine Rammelsberg in Goslar/Germany funded by the Federal Ministry of Education and Research (BMBF) (5). Until its exploitation, the deposit has been one of the biggest deposits for indium in Europe. During the operation until 1988, indium was not extracted. After the closure, the demand increased significantly due to the usage of indium-tin-oxide (ITO) for solar panels and flat screens. The remnants of the deposit are the tailing ponds in which the waste material was disposed in the last fifty years of operation. Under the new circumstances, the potential of the tailings is investigated. For this purpose, the deposit was modelled using historic and newly gained data (Figure 1). Furthermore, approaches for mining and processing are planned. Entrusted with these tasks, the viewpoint of a future generation opened. The research shows which steps in the past could have eased the resumption of activities. For the deposit modelling, historic documentation, data of previous investigations and assays of new sampling were used. The data situation was complicated due to the transformation of the operating company. Hence, only fragments of the operational documentation were available and published data needed to be used. Thus, the request can be formulated to keep and store all captured data to provide the opportunity of usage for future generation. Public archives are important to support the preservation of the knowledge. The possibility of reprocessing should be considered in the selection of approaches in the design and construction of tailings ponds. Often, the dam is supported by the material. This can lead to huge harm in case of a lack of knowledge about the rheology as in the case of the dam failure in the Brazilian state Minas Gerais in November 2015 (6). Also, this kind of construction leads to difficulties in dam reconstruction. The investigations showed a slight weathering caused by the water coverage abetting the reprocessing. Therefore, an isolation of the material relating to surroundings fostering weathering is preferable. In conclusion, a subsequent usage is supported by an early awareness of such possibilities if those thoughts lead to an adjusted planning. To integrate those subsequent and multiple usages into the planning process, represents a goal of the Blue Mining approaches, which focuses on ergonomics and energy. Three main principles frame the approach, which are shown in Figure 2 on the right side. Mine planning should be performed with regard on future possibilities and awareness of impacts and consequences for the future. That way, present and future interest, is considered and doors are kept open to add value as described in the following section (7). Besides surface installations, an underground mine consists of cavities which provide an access to the deposits, facilitate extraction, haulage and processing. Furthermore, the cavities enable the access to the rock mass which can be a source for heat and gases. Value can be added to operation by using this access. Besides, areas in a new depth are constructed. The height difference can be used for pump storage facilities. The restructuring of surface areas provides further possibilities for energy transformation installations. The Blue Mining concepts aim to harmonize those possibilities and the extraction of raw materials during and after the production stage. Assessing only the subsequent usage of abandoned mines, the modification has drawbacks based on previous decisions leading to advantages of new constructions (8). This can be prevented by an early consideration as claimed by the Blue Mining concept. To implement the concept into the planning process, three steps are arranged shown in Figure 3. The accuracy of planning results increases by multiple runs at different stages of mine planning. In the first stage, opportunities are identified. Based on the condition and the demand, opportunities are evaluated. The development of the environment initiated by opening and closure of the mine needs to be considered. For chosen opportunities, conflicts and synergies with the existing plans are identified. 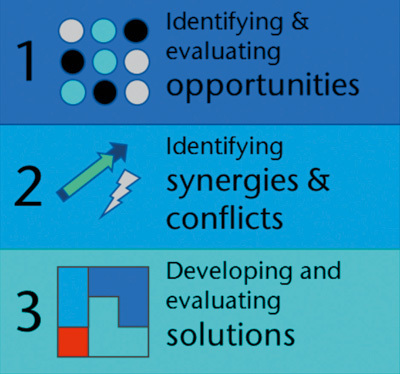 In the third stage, solutions are developed and evaluated. Those should maximize synergies and minimize conflicts. The factors for assessing the solution are chosen with consideration of different dimensions of sustainable mine practice. Results of the process are implemented into the technical planning. An example is the orientation of heaps or roof areas as well as the planning of cavities close to the shafts for the operation of pump storages. Additional measures are developed parallel and extend the benefits of the mining operation outlasting the production phase and leading to long-term positive impacts. Synergies can improve the balance of the whole operation. For measuring and communicating the impacts, the approach of life cycle assessment can be used. Different solutions can be assessed and strength and weakness can be investigated. However, the approach depends on data, which is just slightly available for mining operations. The existing data are based on few case studies which incorporate only environmental but not social impacts (9). For a satisfying application, further development in this field is needed. Responsibility towards people is an essential topic talking about responsible mining, particularly towards the organizations own employees. The responsibility can be divided into three areas: technical, organizational and personal. The technical responsibility can be assigned to the manufacturers and to the management. Manufacturers are intended to design and produce their products according to usual standards. In Europe, it means the compliance with CE standards and in particular with ATEX standards. In other countries further standards are established, e. g. by the American National Standards Institute (ANSI) since 1918. It aims to strengthen the position of the US-market with the global economy and ensure at the same time the safety and health of consumers as well as the protection of environment. Besides the exclusive usage of standardized and certified machines and equipment, the maintenance and repair must be compliant. In future, manufacturers will produce increasingly more automated equipment and machines making the workers tasks easier and safer. At this stage, fully automated machines move in dangerous areas of mines. Eventually, automation is the solution. Thus, nobody can be harmed where no people work (10). The mining company has the organizational responsibility. It is necessary to ensure that equipment and machines are used rule-consistent and safe. Furthermore, the employees need to be informed about the machine control and related hazards. Additionally, the exposure of the employees needs to be monitored to protect them from environmental impacts. Workplace control can be carried out when the workplaces and their exposure, e. g., to noise, heat and dust, as well as the work time at each place is registered. An integrated approach including appropriate medicals survey was conducted, i. e. over decades at the RAG company at its several mines. A safe use of machines can be achieved by using a risk assessment. It is conducted in several steps. First of all, the risks must be investigated by determination of working areas and tasks in the operational structure, hazardous substances table as well as tables of installations and equipment. Secondly, hazards resulting from used machines and substances are investigated and assessed. During the third step, required measures are determined to reduce the hazards. In the fourth step, measures are collected in a table of measures, which can be used for the control of implementation. In the last step, measures are checked for efficiency (11). For this process, it is important to establish an operational structure including an appropriate documentation using an organisation chart. Visualizing all working areas of the organisation, tasks can be assigned to the areas. The organisational structure is the foundation for the systematic determination of risks and hazards. Specialists create risk assessments and control the implementation of measures. Employees get briefed systematically in seminars, so that each employee can detect and handle hazards at his or her workplace. These measures do not only protect the employees but also the social environment having the “VISION ZERO”. Fig. 4. VISION ZERO by BG RCI (12). // Bild 4. VISION ZERO der BG RCI (12). In this context, VISION ZERO means that no accidents should happen. 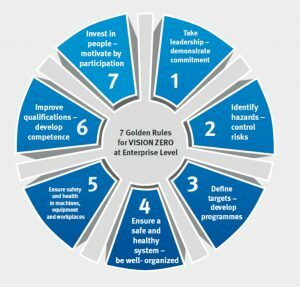 To this, the German Social Accident Insurance Institution for the Raw Materials and Chemical Industry (BG RCI) has introduced the concept „VISION ZERO and the 7 Golden Rules in Mining. Your First Steps to Success in Prevention“ (12). The prevention strategy defines goals for the year 2024 (Figure 4). Quantitative goals are chosen to sensitize all stakeholders to make further efforts and achievements in prevention. Therefore, milestones must be defined and a reporting system has to be installed. For all prevention measures, the effectiveness, perception and acceptance of the social environment must be examined systematically and regularly. The establishment of standby force for emergencies is very important for the social environment. Potential incidents, which are affecting not just the mine itself, can be localized and mitigated in a safe way. The International Council on Mining and Metals (ICMM), which incorporate already six of the ten biggest mining companies, aims to have a central role in the promotion of social and economic development. Encouragement of collaboration amongst the industry leaders should contribute to alleviate poverty and give people access to a better life. Ten principles are defined and all members are committed to them (13). The principles describe responsibility towards the social environment as addressed by this paper especially towards the employees. The principles i. e. refer to respect human rights and interest, cultures, traditions and values of employees and affected communities. Furthermore, the implementation of risk management systems and strategies based on scientific evidence as well risk perception of stakeholders must be considered. By continuous improvement of health and safety efforts, VISION ZERO is pursued as an ultimate goal in principle five. The ninth principle targets the continuous improvement of social services to contribute to the social, economic and institutional development of countries and communities. The topics of water, tailings and post-mining are also focused. The personal responsibility is situated in the social environment. It means for the employees to wear the personal protection equipment provided by the mining company as well as regular medical examinations. By constructive collaboration with the mining company, people from the farer social environment take their responsibility. The mining company contributes by direct and indirect employment of community members as well as by the local business development, the economic diversifications and strategic social investments (13). The responsible mine planning and practice is mandatory for the future of mining. A transparent stakeholder communication is required to prove taking-over of responsibility and ensure the acceptance for the activity. The field of work for future mining engineers includes the communication with different groups as well as the sustainable planning and realisation of mining projects. Hence, the education of mining engineers must be designed for this purpose. the possibility for specialization in the area of sustainability. Possibilities for implementation are presented by (15). The constructive alignment of intended learning outcomes, teaching-learning activities and assessment according to (16) is an essential foundation. Formulated as learning outcomes, the development of skills is the objective of the courses. By the successful and continuous linkage of professional, technical and social skills as well as system expertise, courses and programs can be designed more diverse in the given temporal and personnel framework and aware acting engineers can be educated. But, appropriate teaching/learning activities are required differing from common frontal monologues. Experimental learning spaces can enhance the positive effects of activate learning methods (17). Mining must take over responsibility for human and environment by actions shaped in regards to sustainability, by the development of technologies and decision paths and by the education of engineers, who can look at the bigger picture besides their area and spot the social responsibility. Therefore, all parties involved must collaborate in industry, science, education and community. (1) Mirande, M.; Chamber, D.; Coumans, C.: Framework for Responsible Mining. A Guide to Evolving Standards, 2005. (2) Klein, P.: Why the Future of Mining Depends on Social Change (online). 23 February 2012, 12:00 (viewed 4 January 2018). Available from: https://www.forbes.com/sites/csr/2012/02/23/why-the-future-of-mining-depends-on-social-change/#4a56e9e936f9. (3) World Commission on Environment and Development: Our common future. Repr. Oxford: Oxford Univ. Press, 1987. 0-19-282080-X. (4) Laurence, D.: Establishing a sustainable mining operation (online). An overview. Journal of Cleaner Production. 2011, 19(2-3), pp 278 – 284. Available from: 10.1016/j.jclepro.2010.08.019. (5) Technische Universität Clausthal: Wieder Rohstoffe aus dem Harz: Neues Forschungsprojekt läuft an. Goslar, 14 May 2015. (6) Samarco: One year after the fundao dam failure (online). 2016 (viewed 21 December 2017). Available from: http://samarco.com/wp-content/uploads/2017/01/Book-Samarco_Ingles_v1.pdf. (7) Langefeld, O.; Binder, A.: Blue Mining – Planning future mines today. World of Mining – Surface & Underground. 2017, 69(2), pp 109 – 112. (8) Beck, H.-P.; Schmidt, M.: Windenergiespeicherung durch Nachnutzung stillgelegter Bergwerke. Abschlussbericht. Goslar, 2011. (9) Awuah-Offei, K.; Adekpedjou, A.: Application of life cycle assessment in the mining industry (online). The International Journal of Life Cycle Assessment. 2011, 16(1), pp 82 – 89. Available from: 10.1007/s11367-010-0246-6. (10) Langefeld, O.: Fully Automated Underground Mine. Mining Report Glückauf 153 (2017), Heft 5, S. 429 – 435. (11) Sächsisches Staatsministerium für Wirtschaft, Arbeit und Verkehr: Arbeits- und Gesundheitsschutz in kleinen Unter­nehmen. 2.th ed., 2011. (12) Meesmann, U.: VISION ZERO and the 7 golden rules in Mining. Your first steps to sucess in prevention, 2017. (13) International Council of Mining & Metals: ICMM 10 Principles (online). 2018 (viewed 3 January 2018). Available from: https://www.icmm.com/en-gb/about-us/member-commitments/icmm-10-principles. (14) Shields, D.; Verga, F.; Andrea Blengini, G.: Incorporating sustainability in engineering education (online). International Journal of Sustainability in Higher Education. 2014, 15(4), pp 390 – 403. Available from: 10.1108/IJSHE-02-2013-0014. (15) Binder, A., Langefeld, O., Clausen, E., Hutwalker, A.: Linking Sustainability and Underground Mining: Course development in the Master Mining Engineering. In: Marilena Cardu, ed. 28th SOMP Annual Meeting and Conference. Proceedings- Papers, 2017. (16) Biggs, J.: Enhancing teaching through constructive alignment (online). Higher Education. 1996, 32(3), pp 347 – 364. Available from: 10.1007/BF00138871. (17) Clausen, E.; Binder, A.: Innovative learning spaces for experimental learning: Underground mines. In: Robert Brennan, Kristina Edström, Ron Hugo, Janne Roslöf, Robert Songer, and Daniel Spooner, eds. : The 13th International CDIO Conference. Proceedings Full Papers, 2017, pp. 595 – 604.